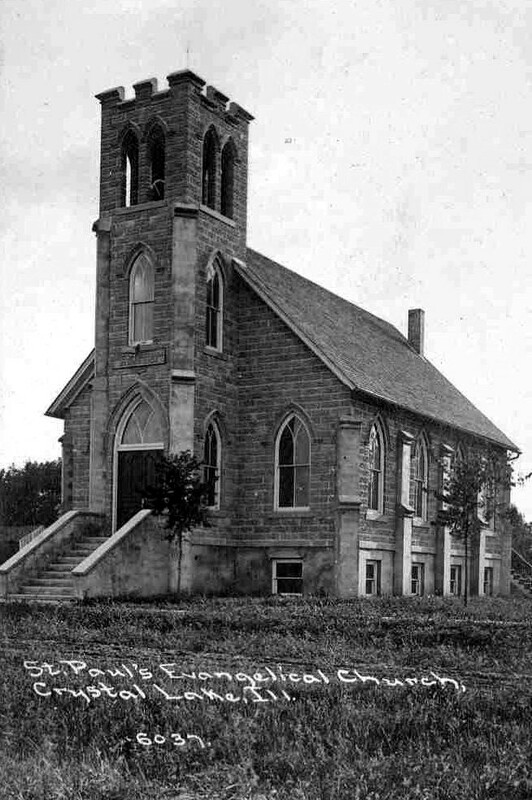 In the summer of 1896, St. Paul’s began as a small mission church under the leadership of Rev. Carl Lohse. Early church record books indicate the first baptism was that of Clara Jesse (August 2, 1896) and the first wedding was that of Frank Knuth and Anna Koch (October 15, 1896). Rev. Lohse left the congregation in 1898. For the next eight years, there was no minister, no services, and no activities. The congregation was reorganized in 1906 with a 13-member congregation and was affiliated with the Evangelical Synod of North America. In August 1907, three lots on Ellsworth Street were purchased for $850, with the intent to build a church and parsonage. The church also bought three lots behind (across the alley) that border North Main Street. On September 11, 1910 the first Sunday service was held in the new St. Paul’s German Evangelical Church. Services were offered in both German and English. Despite its efforts, the congregation remained small. Pastors came and went, each having relatively short pastorates. Oral histories taken from long-time church members recall “Overall Sundays” in the 1930’s. “Overall Sundays” was an attendance incentive offered by the minister. The men of the congregation told the pastor that they didn’t have enough time to do their morning chores and then change into good clothes for church. So the farmers were told that it was okay for them to wear their overalls to church. Despite the offer, this didn’t do much to increase attendance! During the 1940’s, Pastor Paul Umbeck had a strong interest in encouraging youth programs. There was concern that the teens had no place to meet without disturbing others. Pastor Umbeck offered the attic of his carriage house (still standing behind the parsonage). Named “The Loft,” this soon became a favorite gathering spot for the teenage members of the church. Following World War II, the congregation began to grow under the leadership of Rev. Theodore Mayer. Unfortunately, Pastor Mayer’s service was cut short when he went to mail a letter in between Sunday Services and was run over by a train. The congregation continued to grow under the guidance of the next minister, Rev. Harold Wilke. By the mid 1950’s, the congregation determined they had outgrown their present location. The three lots on Main Street, which had been purchased for future expansion, were not zoned for this use, and were of no use to the congregation. Although the congregation had grown in numbers, they still struggled financially. To raise necessary funds for a new facility, the congregation started a tradition of hosting Turkey Dinners. The dinners were held at Mugge’s Hall on North Main Street. These turkey dinners were a hit with the townspeople, and it was often joked that “the Yerkey’s and the Ehrke’s were busy making turkeys.” As many as forty turkeys were prepared and stuffed with Ellen Behren’s famous dressing. In 1959, seven and one-half acres of land was purchased on Woodstock Street, and a new church building was built. The congregation made the move in 1960, and sold the old St. Paul’s on Ellsworth Street to the Nunda Masonic Lodge. Today, St. Paul’s is affiliated with the United Church of Christ.